Description: This fellow and I played tag most of the afternoon; here BNSF 7274 makes a nice afternoon scene at Dalies. Description: Whistling howdee-do, the 7274 comes roaring through. Description: BNSF 7274s entire consist with two DPUs on the rear can be seen as it passes McCartys at sundown. Description: After letting Amtrak by around Laguna, BNSF 7274 comes through McCartys in the evening light. Description: After meeting three east, BNSF 7274 kicks off the brakes and begins its descent into Abo Canyon and the Rio Grande valley. Description: Eastbound Intermodal speeds through WB Junction on the Marceline Sub. 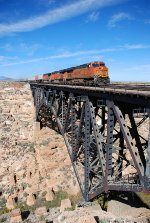 Description: Three Gevos leads and eastboung Z train over Canyon Diablo Arizona. Description: A warm spring day in Saginaw is in progress while a pair of BNSF GEs roll a freight through down. The cab sunshade is working at maximum output. Title: BNSF 6534 Heads a Wb auto train down the transcon!!! Description: WB bnsf auto train with a newer c4 gevo on the point. Description: BNSF 7476 & 6914 get a fresh crew for their eastbound train at Rochelle, IL. Title: BNSF 7476 Heads the U BIRSEM into the siding at Old Monroe Mo. 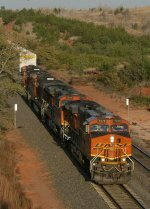 Title: BNSF Dash9 & ES44DC.